If you’re looking for a deliciously EASY crockpot recipe…this slow cooker sausage and potatoes dish only takes 5 to 10 minutes prep work AND 5 to 7 ingredients too! You can use any sort of smoked sausage as well. Turkey sausage, kielbasa or anything of the sort. We prefer the uncured pork sausage, but that’s our personal preference. It’s partially for health reasons and partially because we prefer the taste. Again, any sort works. You choose what’s best for YOU and your personal needs. Some of them will “puff” up more than others, all taste really delicious. And taste…well, that’s more important than pretty in my book. 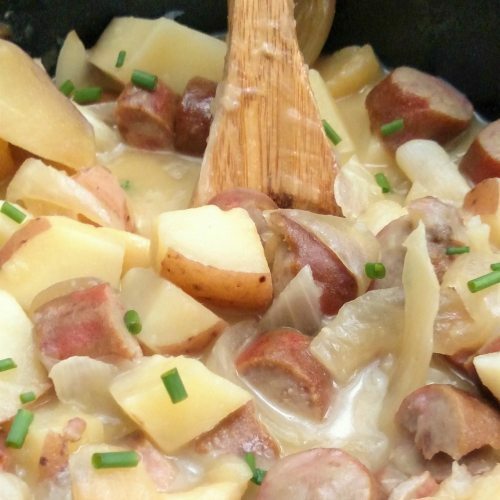 Deliciously easy slow cooker sausage and potatoes. It takes just 5 to 7 ingredients and about the same time to toss this yumminess together too. 0 Response to "SLOW COOKER SAUSAGE & POTATOES"